It looks like the long-awaited Obi-Wan Kenobi movie could be filming in Ireland next year. It's been discussed to death at this point, but it seems like an inevitability that, at some point, Lucasfilm is going to pull the trigger and make a Star Wars standalone movie centered on Obi-Wan Kenobi, with Ewan McGregor reprising his role as the legendary Jedi from the prequels. Now, a new report claims that location scouting for the movie was being conducted recently in Belfast by none other than George Lucas, which is another rather interesting development. Since this news isn't coming directly from a studio source or anyone actually connected with the production of the possible Star Wars spin-off, it should be regarded as rumor for now. That said, a local publication from Belfast has reported that George Lucas, who sold all of Lucasfilm to Disney in 2012 and has only tangentially been involved in the new Star Wars movies ever since, was taking a tour of Paint Hall studios in Belfast and scoping out other possible filming locations for the Obi-Wan movie. The publication also states that a Star Wars spin-off will film there in 2019, making it sound like this is already a done deal. Here's what an unnamed insider had to say about the visit from Lucas. "We've been told there will be work throughout 2019 because Star Wars is coming to Belfast. 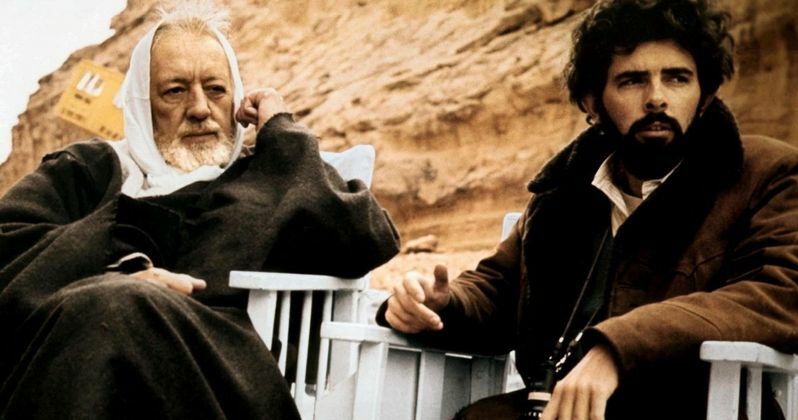 It was all very low key, only a few people knew that the old guy walking round the set was George Lucas. It was only when we were told about Star Wars coming here next year that it dawned on us that was why he was here before Christmas." Lucasfilm President Kathleen Kennedy had originally said that the next Star Wars standalone would be announced during last summer, but given what ended up happening with Solo: A Star Wars Story and the uncertainty now surrounding that movie's performance, the studio has yet to announce any more standalone movies in a galaxy far, far away. Despite that, it was reported last year that director Stephen Daldry (Billy Elliot, The Reader) is in talks to helm the movie. It's also worth noting that Ewan McGregor, who is the key to this whole thing happening, has repeatedly expressed his desire and willingness to return to the role, but still says that he doesn't know anything about it. Here's what he had to say when asked about the possible Obi-Wan movie at the Golden Globes. "There's a lot of talk, I'd be happy to play him again, but I don't know any more about it than you do." Instead of announcing any more standalone movies, Lucasfilm his announced a new trilogy of movies from The Last Jedi director Rian Johnson and a new series of Star Wars movies from Game of Thrones creators David Benioff and D.B. Weiss. Both of these sets of movies are said to be taking place outside of the Skywalker saga and will explore new territory. Some have speculated that this could mean Lucasfilm is moving away from standalone movies, which could put the Obi-Wan movie in jeopardy. Without a doubt, the most interesting part of this particular report is that George Lucas is actually involved heavily enough to be doing location scouting for the Obi-Wan movie. He's helped out a bit on the standalone movies so far, making a suggestion to Rogue One director Gareth Edwards and actually helping to direct a scene with Ron Howard on Solo: A Star Wars Story, but this sounds like he's actually got his hand directly in the mix. Having directed all three prequel movies, is it possible that he'll return to direct Obi-Wan? Will he be attached as a Producer? In any case, it sounds like we may be hearing something a bit more concrete about the Obi-Wan movie in the relatively near future. This news was first reported by the Belfast Telegraph.